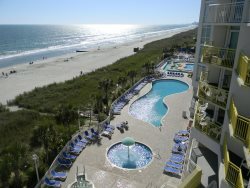 This direct oceanfront three bedroom condo has some wonderful views! Enjoy sitting on your couch and watch the pelicans fly by. Great people. Real people. No phoniness. Comfortable environment and very clean. The door to the bathroom off the master bedroom needs adjustment. It does not latch or lock. Judy, and the staff at North Shore Realty treat us snowbirds like family every year we visit :) Have never considered working with any other realty to book our vacations. It was amazing this year! We had the opportunity to vacation with our 2 daughters and their families. Having our 4 grandchildren with us, literally in our bed, waking up every morning to experience a breath taking sunrise from our room, will be cherished forever in our hearts and memories. Thank you for the memories and experience. We look forward to next year and can't wait to return!